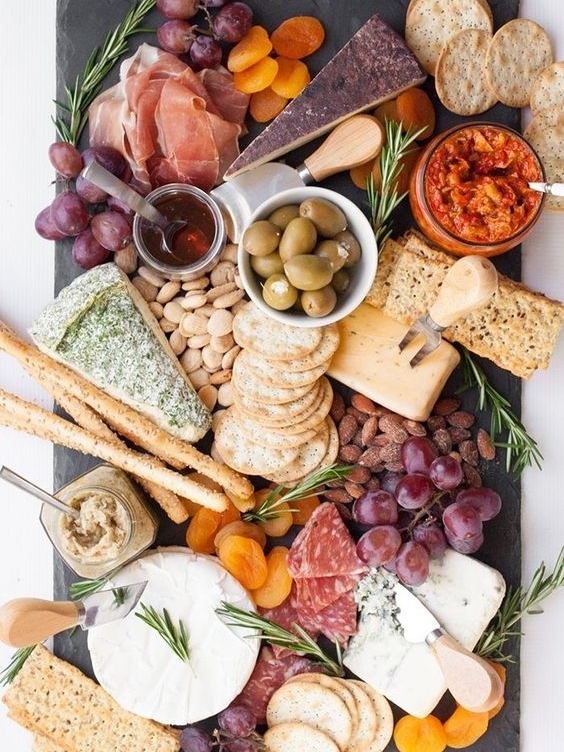 How do you design a beautiful cheese board? Go crazy! Include lots of stuff, don't skimp, pile it on. I arrived early at dear friend Sarah's for game night and asked what I could do to help. She requested that I put together the cheese board. She had all the wonderfully diverse ingredients already + a gorgeous long cheese board, so it was easy! What types of things should you include? Toffee-crumble this around. Yes, I know it sounds weird, but my friend Amanda does this, and it is always a hit. I just randomly grouped them into piles, spread out so that if you were sitting on the other side of the table, you still had access to everything. Color! You want different colors. Diversity: some sweet, some salty, some crunchy, some soft. Different shapes & sizes. Fill it up. The images below look beautiful because they are full.